As a kid, Andre McHenry loved playing with Legos. Fast-forward 15 or so years and McHenry has found a career where he can knock down walls, build them back up on a larger scale and be a part of making buildings he dreamed about building as a kid. 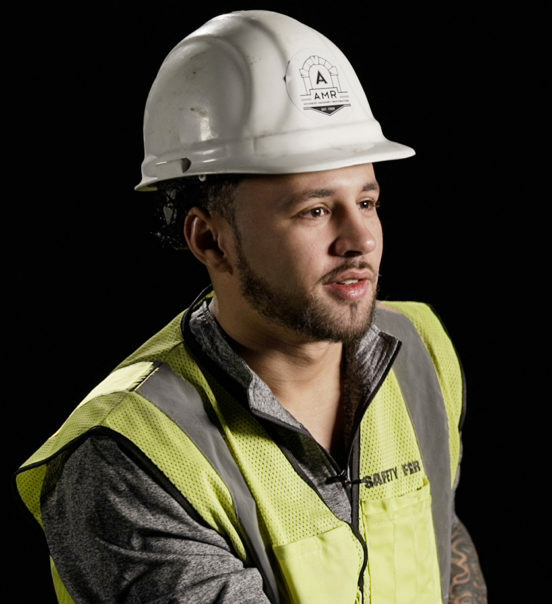 McHenry works as a PCC/Bricklayer as a part of the Bricklayers and Allied Craftsworkers (BAC) Local 1, based in Minneapolis, Minnesota, working for Advanced Masonry and Restoration in St. Paul. At only 24 years old, McHenry has been employed for more than six years as a bricklayer. Like many teenagers in high school, McHenry was unsure what to do for his future. “In high school you get slapped with a test and expected to just know what you are going to do,” says McHenry. After receiving his high school diploma, McHenry heard of an exciting opportunity – getting into a trade. In the pre-apprenticeship program, McHenry was able to complete an impressive 2,000 hours towards his total apprenticeship training. This gave him the opportunity to immediately level up, and after an additional two years he was a journeyman. “It got even better once I got into the union,” says McHenry. “I have a three-year-old son so it’s been huge to be able to make good money right away and have these great benefits,” McHenry says. A focus on family is something McHenry doesn’t take lightly. Growing up without any significant role models and the big responsibility of raising his younger brother as well, McHenry was ready for a change. As the name entails, McHenry lays bricks. 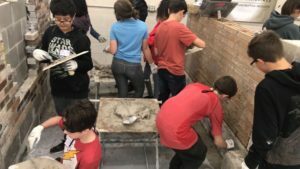 But he also gets to do much more than just bricklaying, such as laying specialty stone such as marble and tile, as well as caulking, setting up scaffolding, and more. He’s gotten the chance to do restoration work on a number of historical buildings such as the Minnesota State Capital, the Mill City Museum, and the famous Grain Belt Brewery. “My work is recognized,” says McHenry. “I get a sense of pride when I finish this work, pride in doing the work to make an incredible, historic building last”. To be a bricklayer, one has to be ready to take responsibility and work hard. But with the help of coworkers, McHenry knows he’s in good hands. When asked about all the benefits other than enjoyment and pride, McHenry explains that the money is great, you can make a great living, earn a pension, get excellent healthcare, and the job includes a “free” workout. “I’ve already saved $29,000 in my Health Savings Account (HSA),” says McHenry. As his career has progressed, McHenry realized that saving is really important. At first, spending was easy, but with his son, Giovanni, he knew saving and planning for the future was in his best interest. Going into a trade is not only something great to get into, but a great way to come out with something. For McHenry, that something has been financial security, pride in his work, and a new family found in the union. To learn more about construction apprenticeship opportunities, visit ConstructionCareers.org. To learn more about the Bricklayers and Allied Craftsworkers (BAC) Local 1, visit bac1mn-nd.org.